If leadership were an organization it would rival cable companies and airlines in the degree of customer dissatisfaction. While leadership is in great disrepute to be fair, leadership is a difficult profession and evaluating it honestly leadership is not easy. First, beauty is in the eye of the beholder. If one person does not like a leader’s action, that leader is rated as horrible; if another person likes the same action, the leader is fantastic. Second the timeframe over which a leader is evaluated is important. Leaders are often evaluated on a decision-by-decision, action-by-action basis. Under this type of scrutiny every leader will, at times, be considered deficient. A much better evaluation occurs over the long-term. From this perspective, leadership may vacillate over time but will generally (not always) revolve around a consistent style. See https://9by9solutions.com/2015/04/leadership-in-pictures-5-the-myth-of-the-perfect-leader/ for more detail on how leaders vacillate over time. Leadership styles and organization culture are much alike. They are both mysterious and somewhat invisible although their impact is almost always visible. Many people are confused about what constitutes culture and that confusion exists about leadership styles. Both are the same in one important aspect, they are developed based on how people behave, not what they say. Both organization culture and leadership can be healthy or unhealthy. Both are created, either by design or by accident. Finally, both leadership styles and organization culture can significantly impact others; they have the capacity to provide great comfort or great angst to those impacted by them. What leaders believe in their hearts (not their heads) about people and productivity determines leadership style. 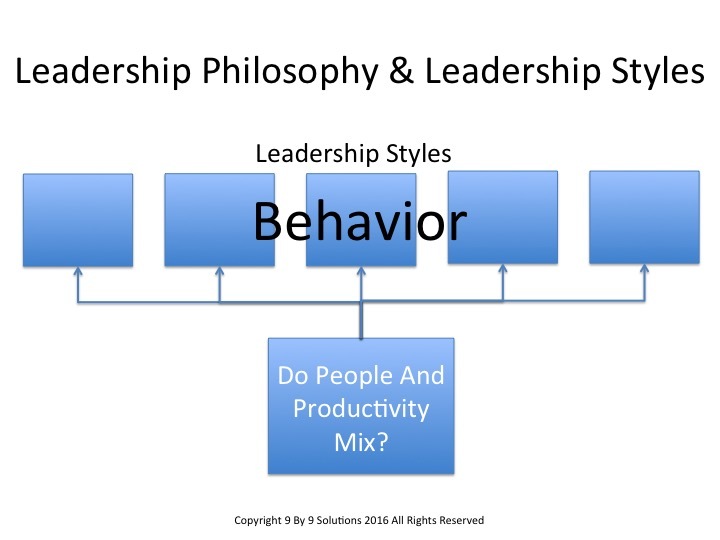 In part 1 of this series (see https://9by9solutions.com/2016/12/shoddy-leadership-90-of-leaders-are-average-or-worse-why/) we discussed how Douglas McGregor challenged leaders to ponder the question, “Do people and productivity mix?” This question forms the core of leaders’ philosophies that ultimately determines how they approach people and productivity; the two major concerns of everyone in a leadership position. II. 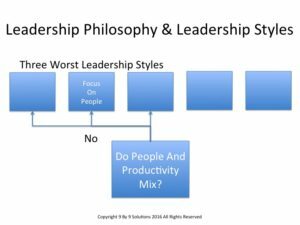 Shoddy Leadership Styles Resulting from a Belief That People and Productivity Do Not Mix. There are three possible answers to McGregor’s critical question. 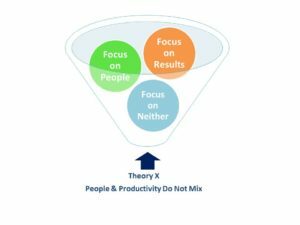 The first response is that people and productivity do not mix and therefore, leaders must choose which area will be the focus. The belief that people and productivity do not mix leads to three shoddy leadership styles. It is very interesting that while these three styles are very different, the core belief behind the three styles is identical. This leader does not believe that people and productivity mix. He or she believes that a leader is put into a position because he or she alone is capable of getting the job done. This leader intends to do just that. This leader does not see how one can keep people “happy” and simultaneously achieve quality work. In fact employee happiness is seldom in their vocabulary. In this leader’s experience people generally do not do good work unless someone of superior talent and authority monitors and oversees their efforts. Because this leader wants to fully maximize results, he or she believes that it is his or her responsibility to insure that work is performed to his or her level of expectation. As a result, the leader must oversee every detail. People are simply a tool to achieve results and cannot be trusted to act on their own. Thus this leader often leads through emotion, especially anger when others disappoint. 1. “My way or the highway” mentality. •	Immediate response to the leader’s requests or orders is required. •	The leader controls all decision-making. 2. The leader critiques all work and clearly and decisively points out faults and mistakes. This serves to reinforce the fact that the leader is all-wise and followers are all – stupid. 3. One-way downward communication. This leader does not appreciate feedback except for praise from others. 4. Conflict between employees over options is seen as childish and therefore is treated with decisive leadership action. Continued conflict is not tolerated. 5. This leadership style throws new employees into the fray; the good ones will swim and the bad ones will sink. This leader wants to find out quickly so that shoddy workers can be gotten rid of quickly. 6. Micromanagement – details are important and workers are to perform as the leader wishes. This often requires the employee to read the leader’s mind. When this does not happen, this leader’s belief that he or she is the only one who can see the situation clearly and this reinforces his or her notion that he or she is truly superior to those who toil beneath them. Success comes from one criterion: following directions – no more, no less. 7. When mistakes are made, blame is placed; when problems occur, it is the employee’s fault. 8. High quality is always expected but it is measured against what the leader defines as quality, not against what was possible. 9. Innovation comes from the leader only. “Not invented here” is the hallmark of this leadership style. This style is not always a fire-breathing, in-your-face autocrat. There is also a version of this style that manifests itself in a benign, benevolent autocrat who views employees as his or her children. The leader protects all of his or her “children” but none of them had better ever “cross” the leader. Rather than respond with anger, disappointment in others is characteristic of this version. The characteristics above are still valid but they are performed with a veneer of politeness and courtesy. Long-term result: Unless this person is a one-of-a-kind genius (Rickover, Jobs), better than average results will never be achieved over the long-term. (Emotion and anger can create superior performance in the short-term.) Of course as this intensity continues, it tends to burn staff out over time. Staff is conditioned not to think or act without the leader’s direction. As a result, there is high energy when the leader is present but “goofing off” when he or she is not around. Employees, when faced with problems will wait to be told what to do. Since the leader cannot be everywhere at all times, problems languish waiting for direction. As these issues build up in the leader’s queue, the leader becomes more frustrated with the incompetence of the staff. Outward activity under this leadership style appears high but over time results are no better than adequate because initiative and thinking are centralized in the leader alone. Mere mortals cannot use this style effectively. Leaders who are not geniuses do not have all the answers and must depend on others for input and involvement. Therefore it is very hard for the average leader to be successful using this as a primary style of leadership. This leader is usually not liked as a person, but will be respected in one critical sense: he or she is brutally honest and direct: employees will always know what this leader thinks of them and their work. For that reason alone, many employees prefer this style to the other two worst styles described below. This leader does not believe people and productivity mix but he or she wants to be liked. He or she comes from the human relations school in which care for the employee is the preeminent leadership task even at the expense of producing results. “People are our most important product” is this leader’s motto. This style is one of the most dangerous because this leader tells people what they want to hear. (This may be one of the worst things a leader can do to knowledge workers.) Read https://www.fastcompany.com/3066302/why-trying-to-be-a-people-pleaser-makes-you-a-bad-boss. When employees compare stories they find they are all being told different versions of the story and, as a result, trust and respect for the leader deteriorates. 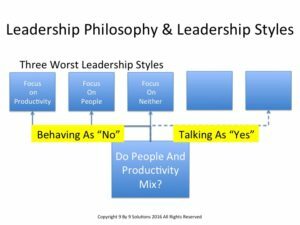 Interestingly enough employees will often say they like this leader as a person but do not respect him or her (just the opposite of what they say about leadership style 1 above). Finally, this leader is thrilled with the happiness movement because in his or her mind the key to high productivity is keeping employees happy and when that is done people will work hard. 1. Set goals so that all employees can reach them. This leader does not want any employee to outperform the group (it will make the group feel bad) or underperform the group (it will make the employee feel bad). 3. Conflict is considered disastrous to the well-being of the group. As a result, it is managed by pouring oil on troubled water. The leader puts off addressing issues off hoping that it will be addressed at a later time and because the leader does not want to support one person over another. A. Conflict is driven under ground so that cliques and camps form in the informal organization. There will always be the undertone of dissatisfaction under this style. 4. Performance evaluation and feedback are always positive. 5. Salary increases are given to all employees because everyone tried hard. This leader does not want to indicate that some employees perform better than others. 6. When problems occur, it is never the fault of an employee. 7. Innovation is discouraged unless the entire group agrees since no person can look better than the rest. As a result the few innovations that occur become large and cumbersome, as everyone’s ideas must be reflected in the final design. 8. If this leader ever pushed beyond their comfort level, they can easily transfer to style 1 above for a short period of time (after all the central belief of both styles is identical). Long-term results: Over time this style only achieves minimal performance at best. This leader is often liked as a person but not respected as a leader. This leader is viewed as weak and two-faced. Staff begins to wonder what value the leader adds since all decisions must to be made by the group. Additionally, while this leader wants a happy workforce, overtime an unhappy, de-motivated workforce develops and cliques form. Finally, high achievers quickly look for other positions as they realize this leadership style will never contribute to their growth or career advancement. This leader does not believe people and productivity mix and they choose to focus on neither one. He or she is referred to as “mentally retired”. The leader may have one day or twenty years to retirement but this leader has quit trying. This person no longer wants the role of leader but he or she cannot afford to leave the position. This style may occur because this leader tried one of the other styles above and met with significant and painful failure or because the group so resisted this leader that he or she has given up trying. The problem is the person still wants the leadership position because of pay or status and therefore he or she fills the position without adding any value. 2. Pass the buck. If senior management has a problem with work performed, the leader will point fingers at the employees. If employees have complaints, the leader blames upper management. This leader is often called the teflon manager because accountability does not stick to him or her. 3. Protect oneself from responsibility; “You can’t blame me if I was not there” is his/her mantra. If conflicts or difficulties arise this leader will leave the workplace. 4. Provide no direction, guidance, communication or feedback to the employee – “read the manual” is the highest level of direction. Long-term results: Unless senior management addresses this situation, the entire unit will eventually morph into a “mentally retired” mindset, as the only type of employee that can co-exist with this style is the disengaged. Because this leader has given up, it is a very frustrating place for most employees to work. The one exception is when a highly talented employee recognizes the opportunity and bypasses the mentally retired leader to build relationships with senior management. As upper management is pleased because something is finally getting done, they often give this motivated employee opportunities well above his or her pay grade. Eventually this employee will become frustrated as he or she feels they are doing the manager’s work (and not getting the pay). This employee will be promoted or leave and things in this leader’s unit will return to normal. III. Is It Good To Be Consistent With A Bad Style? Each of these styles of leadership creates the an organization culture in which 1 + 1 < 2. Each of these styles sub-optimizes the time, talent and resources entrusted to that leader. None of the three styles will ever build great sustainable organizations. But if the leader uses the style consistently, at least employees know what to expect and can adapt to the leader but that is not always the case. 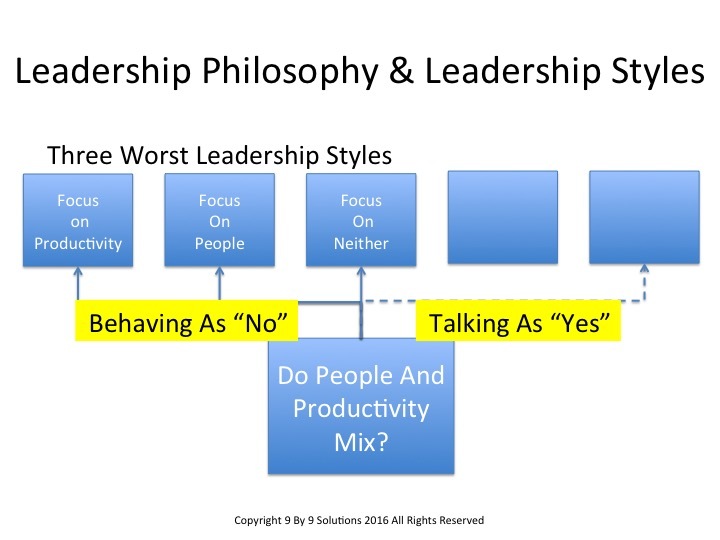 As much as we like to think leaders are consistent in their styles, many are not. Leaders often fluctuate between all three styles (sometimes on a daily basis). They may treat one staff member (a favorite) with one style and a second staff member (disliked or unpopular) with a second, very different style. (This is one of the major causes behind perceived subtle favoritism.) The leader may perform one function of their job using one style (i.e., use an autocratic decision-making approach in planning) and use a very different style in a second management function (i.e., performance feedback is ignored and never given). This inconsistency sends messages to employees. The example above clearly communicates that the leader is concerned about controlling the goals (planning) but has little concern about results, giving the individual’s no feedback or credit. Inconsistency causes great consternation to employees. An inconsistent leader alternating between a high concern on productivity and a high concern for people often confuses them. See http://blog.idonethis.com/google-most-important-leadership-trait/. Each of these 3 leadership styles stems from the basic belief that people and productivity do not mix which is a Theory X leadership philosophy (see https://9by9solutions.com/2016/12/shoddy-leadership-90-of-leaders-are-average-or-worse-why/). Because these three styles have a common philosophical belief, it is easy to understand (but not to justify) how a leader can switch between the diverse styles without any consternation on the leader’s part about their inconsistency. Result? All three of these leadership styles are shoddy workmanship and do significant short and long-term damage to organization and staff. IV. Should A Leader Ever Use One Of These Three “Worse” Styles? The description of these styles often causes practicing leaders some concern. Many see themselves in the descriptions of these inappropriate styles and almost all feel they have at some time, used each of these styles. Others will ask if it is inappropriate for a high achieving leader ever to use one of these styles. This raises an important issue that must be understood about leadership. 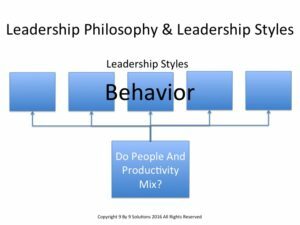 The three style descriptions above describe a philosophy of leadership – they describe where a leader lives (the primary style) and how they behave on a day in, day out basis. There are specific situations that require high achieving leaders use the styles described above. For example an autocratic decision may be made when the leader knows a decision is faulty, and the consequences and risks are unacceptable. They may make an autocratic decision when there is an ethical or safety issue and inappropriate action is being considered. The distinction is that the high achieving leader does not “live” in this style. The high achieving leader will use these three styles sparingly but appropriately which means when one of these styles is used, there is communication to explain why the leader is acting in this manner. A good exercise for any leader is to ponder under what circumstances they would use each of these three styles described above. If a leader realizes he or she is using any of these three styles on a regular basis (either with a specific individual or in performing specific leadership or management functions), there should be an immediate assessment of the behavior. Because leaders often have blind spots in this area, feedback from trusted advisors is helpful. One last comment must be made about the inconsistency between the walk and the talk of leaders. Great damage is done when leaders talk as if they believe people and productivity mix but act as if they don’t. This occurs when organizations have strong leadership training and development efforts that teach all the latest fads and gimmicks of leadership. As these three styles go through this development, they pick up the latest leadership phrases and often use them in talking to staff. As staff see that the leader still operates in the primary “people and productivity do not mix” style, they see the discrepancy between the leader’s word and actions. As a result, trust decreases and disrespect grows. As higher levels of management allow lower level leaders to continue in the subterfuge, there is significant damage to the organization culture. Should A Leader Praise A Team For Trying Hard But Finishing Second? Great insights and excellent lessons about leadership. Thank you Doug Wilson.